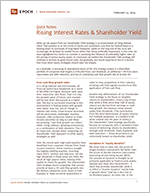 Rising Interest Rates & Shareholder Yield - Epoch Investment Partners, Inc.
What can we expect from our Shareholder Yield strategy in an environment of rising interest rates? That question is on the minds of clients and consultants now that the Federal Reserve is slowing down its purchases of long-dated Treasuries; yields on the long end of the curve will increasingly be dictated by market forces rather than being artificially suppressed. In this note, we have highlighted four factors to consider in assessing the influence of potentially higher rates on the pricing of various equity assets. In conclusion, we believe the Shareholder Yield strategy will continue to achieve its goals should rates rise gradually, and would experience less of a decline than most other equity strategies should rates rise sharply. As a reminder, in pursuing its aspirational return of 9%, this strategy invests in a diversified portfolio of companies that targets a 4.5% yield from cash dividends, an additional 1.5% from share repurchases and debt reduction, and has an underlying cash-flow growth rate of at least 3%. Shareholder Yield approach to other equity strategies as well. Over the recent past, high-yield equities have benefited from crossover interest from fixed-income investors. These investors bought the highest-yielding equities, including many REITS, utilities and telecoms. Yet the high dividends in these areas are often the result of high payout ratios, leaving little capital to invest for growth. The Shareholder Yield strategy shuns companies that cannot provide at least a 3% cash-flow growth rate. We believe companies must invest in their business or make accretive acquisitions in order to stay competitive in their industry. Growing cash flow signals success from this application of free cash flow. Another key differentiator of our Shareholder Yield strategy is the focus on tangible returns to shareholders. History has shown that while a little more than half of equity returns are derived from earnings or cashflow growth, the balance comes almost solely from dividends. (The contribution from the third determinant of equity returns, P/E multiple expansion, is a modest 0.5% when viewed over 85 years of history.) The Shareholder Yield strategy specifically focuses on companies with a consistent track record of delivering returns to shareholders through cash dividends, share buybacks and debt reduction — these three factors are collectively known as shareholder yield. We know that as rates rise, the prices of longer-duration instruments fall faster than the prices of shorter-duration instruments (assuming all else being equal). While the concept of duration is thought to be primarily applicable to fixed-income assets, equities also have this characteristic. A stock that provides shareholder yield is in effect a “shorter-duration” equity than a “growth stock” that has a very low or no dividend payout. As rates rise, in the absence of extraordinary economic growth, stocks that pay shareholder yield should perform better as a result; more of their return is ”up front” so to speak. This factor applies broadly to Epoch’s free-cash-flow investment style as well. By looking for companies that generate free cash flow now rather than the hope of free cash flow in the future, we effectively have a shorter-duration investment strategy, with less volatility than most other managers. Another consideration is that the discount rate is a combination of the risk-free rate and a risk premium. Prior to the Fed’s first hints about tapering this past April, it was widely assumed that the risk-free rate was not going to change in the near term. This elevated the influence of any change in the risk premium affecting security prices. That assumption may change with expectations that the risk-free rate is on the rise. The risk premium (and therefore, the discount rate) applied to global champions that provide shareholder yield is frequently lower than that for the broader market. It reflects a higher degree of certainty that companies such a Coca-Cola, Anheuser-Busch InBev, and Philip Morris will grow their free cash flow and their payouts to shareholders more reliably than most other firms. That belief provides ongoing support to the valuations of these companies, and is a long-term benefit to the patient investor. Embedded in the Shareholder Yield strategy is a unique portfolio construction process designed to minimize the influence of any single source of cash: dividends, share buybacks, or debt pay downs. This active risk management process seeks to deliver our 9% solution through a globally diversified portfolio of equities. Position sizes are limited with the respect to the contribution incurred from any single security to the portfolio’s overall current yield and growth rate of yield associated with that individual holding. So while each stock in the portfolio is thoroughly researched by our analysts, our risk management discipline ensures that no single holding jeopardizes the portfolio’s goals. Companies in the highest quartile of shareholder-yield payers within the S&P 500 Index outperformed companies in the highest quartile of cash dividend yield payers in 2013. (The former group also outperformed the latter one going all the way back to 1985, the origin of the data series for this comparison.) This outperformance, shown in the chart below, began with the market jitters in April 2013 as investors began anticipating the Fed’s tapering of asset purchases. We present the S&P 500 Index as a proxy for global equities, since similar data is not available for the strategy’s benchmark, the MSCI World Index. The Fed is slowly unwinding its unconventional monetary policy measures. The policy itself was unprecedented and the wind down will no doubt have some unanticipated consequences (particularly with respect to currencies and global liquidity effects in emerging markets). Rising interest rates, however, are also often initially associated with cyclical growth. In that case it implies economic recovery and hence, rising earnings. Rising earnings support rising dividends. Furthermore, dividend payout ratios remain below their long-term averages and many companies have record amounts of cash on their balance sheets, giving further support to a continuation of dividend growth. We see little reason to doubt continuing success for this strategy. The information contained in this presentation is distributed for informational purposes only and should not be considered investment advice or a recommendation of any particular security, strategy or investment product. Information contained herein has been obtained from sources believed to be reliable, but not guaranteed. The information contained in this presentation is accurate as of the date submitted, but is subject to change. Any performance information referenced in this presentation represents past performance and is not indicative of future returns. Any projections, targets, or estimates in this presentation are forward looking statements and are based on Epoch’s research, analysis, and assumptions made by Epoch. There can be no assurances that such projections, targets, or estimates will occur and the actual results may be materially different. Other events which were not taken into account in formulating such projections, targets, or estimates may occur and may significantly affect the returns or performance of any accounts and/or funds managed by Epoch. To the extent this presentation contains information about specific companies or securities including whether they are profitable or not, they are being provided as a means of illustrating our investment thesis. Past references to specific companies or securities are not a complete list of securities selected for clients and not all securities selected for clients in the past year were profitable.